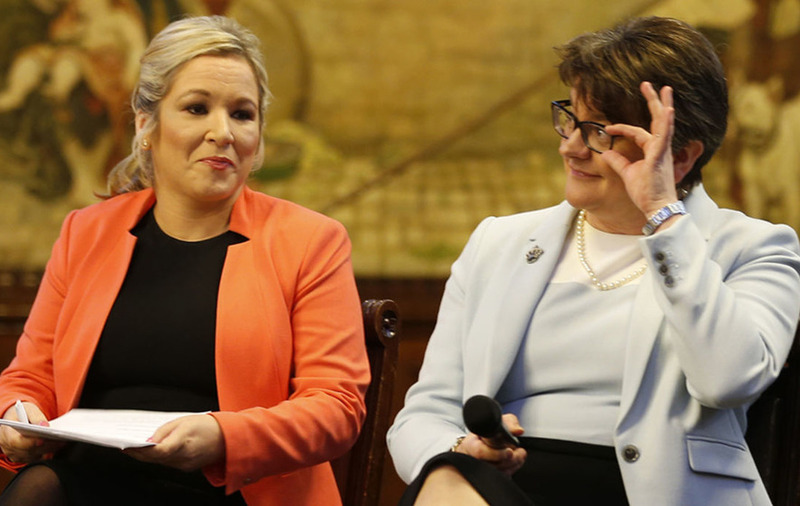 Arlene Foster and Michelle O'Neill have clashed over the Irish Language Act during a joint appearance at a Tory Party Conference fringe event in Manchester. Asked if Sinn Féin want Irish language legislation to make Northern Ireland look less British, Mrs O'Neill, its leader in the north, said "the north isn't British". 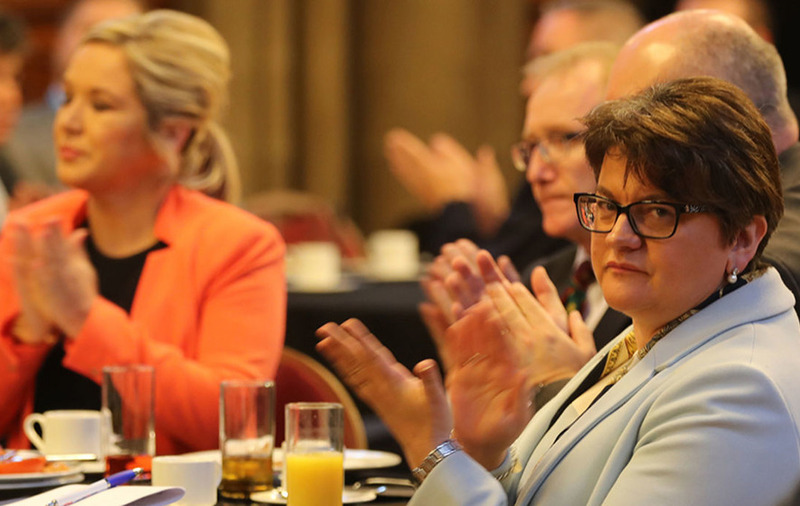 DUP leader Arlene Foster shot back, according to the BBC, to say "Northern Ireland is British" but that she did not want to turn the event into a row. 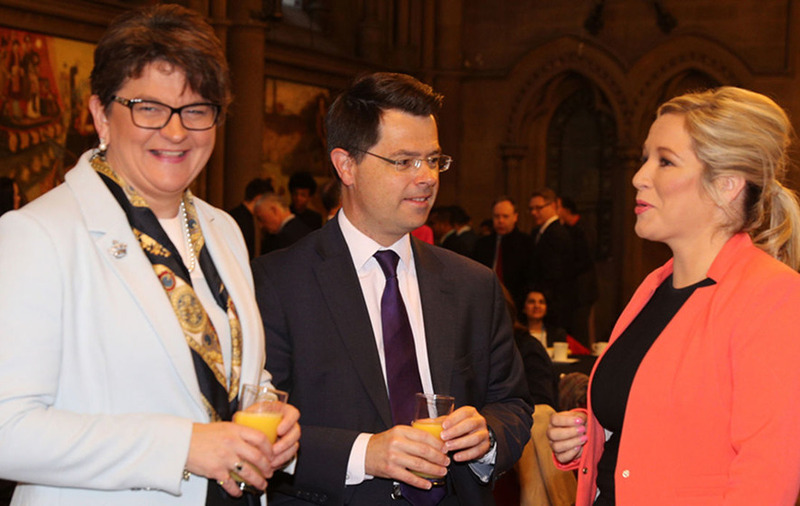 The rare joint appearance saw the two women share a table for breakfast before sitting side by side on the stage in the Great Hall in Manchester's Town Hall. 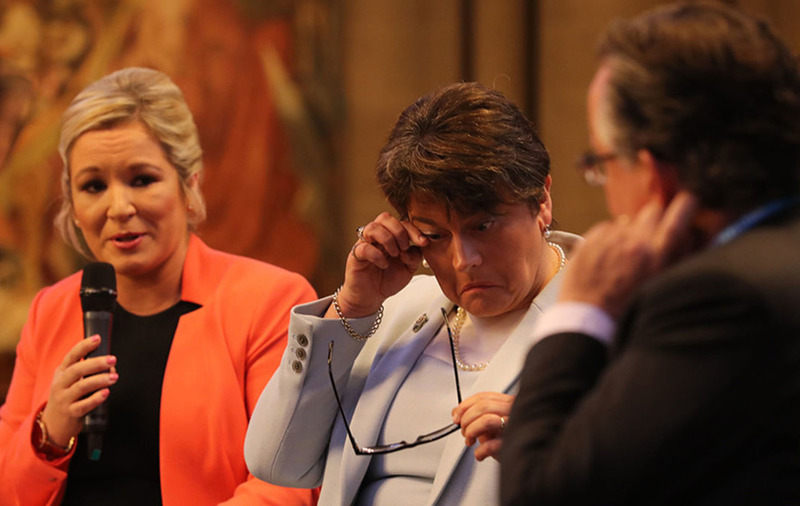 One Tory activist told the pair he hoped they would become known as the "Chuckle Sisters" - a reference to the Chuckle Brothers tag given to the surprisingly warm relationship Ian Paisley and Martin McGuinness developed when they led the power-sharing government. But the leaders showed no sign of reaching a breakthrough despite both insisting talks had intensified. 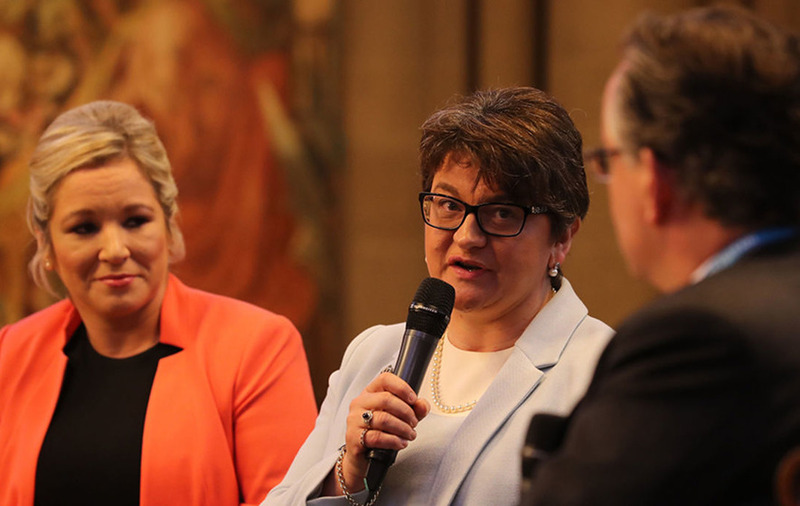 Arlene Foster insisted that the DUP’s newfound influence in London would not distract from trying to re-establish a Northern Ireland Executive, which collapsed in January. 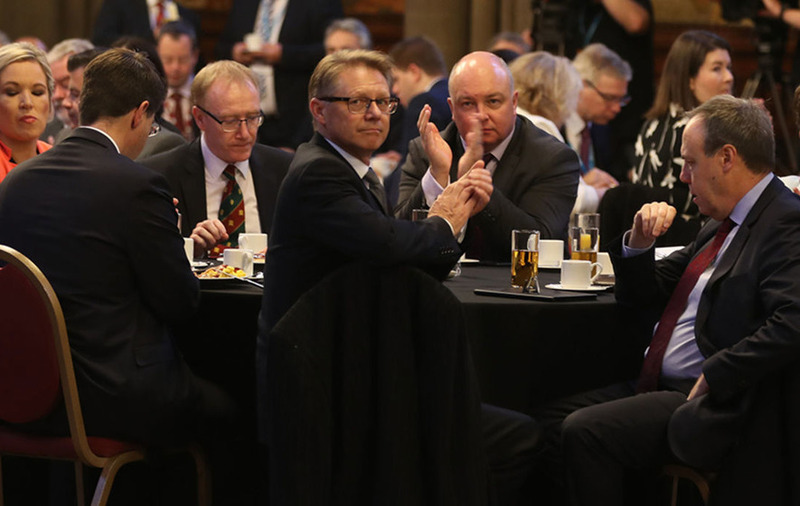 It was Ms Foster's first public address to the Tories since the signing of the controversial confidence and supply arrangements between the DUP and Tories in June. 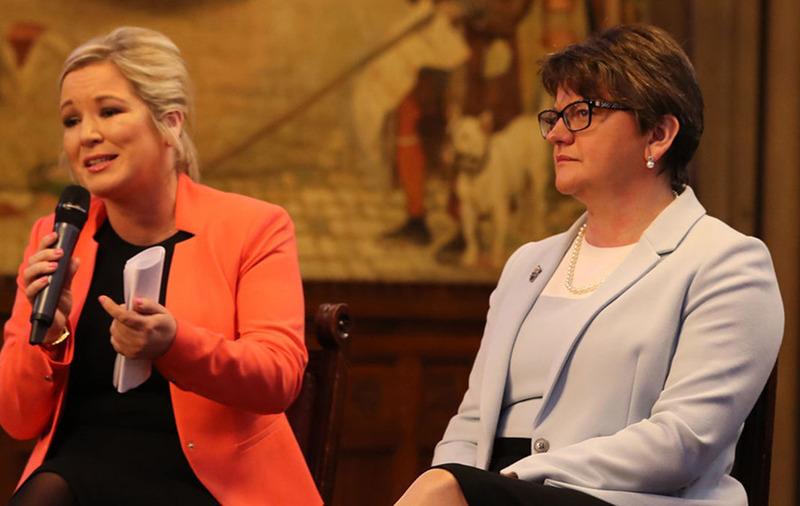 “It is not a choice for the DUP between influence in London and executive power in Belfast. 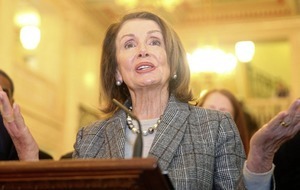 What is in the best interests of Northern Ireland is operating in tandem and this remains our goal,” she said. 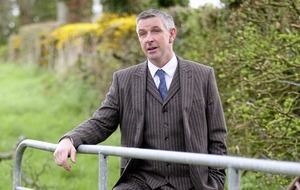 Ms Foster said that progress had been made during talks with Sinn Féin about forming an executive. However, the Irish Language Act remains a sticking point. Sinn Féin have made clear that it is a make or break issue for power-sharing in Northern Ireland. 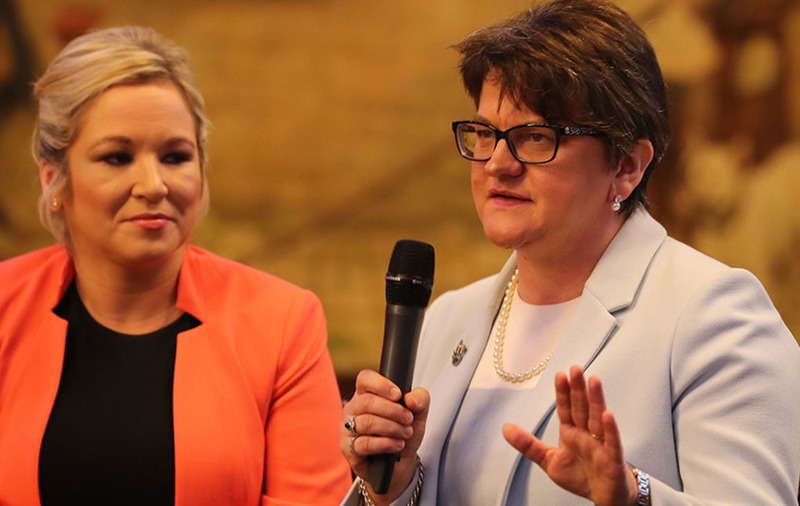 Mrs O'Neill that Sinn Féin remain committed to reforming an Executive but warned that the British Government "should not think hat they can cobble together a deal acceptable to the DUP and then shoe horn Sinn Féin into acqueising to it." "That will not happen," she said. "The shape of a deal is very clear. The two governments know this. So do the DUP and the other parties." 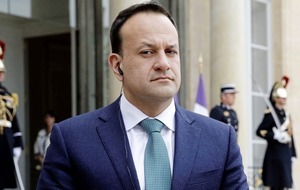 Mrs O'Neill said that a political breakthrough "is entirely possible" but only if the right of every citizen to their democratic social, economic, civil and political rights is guaranteed. 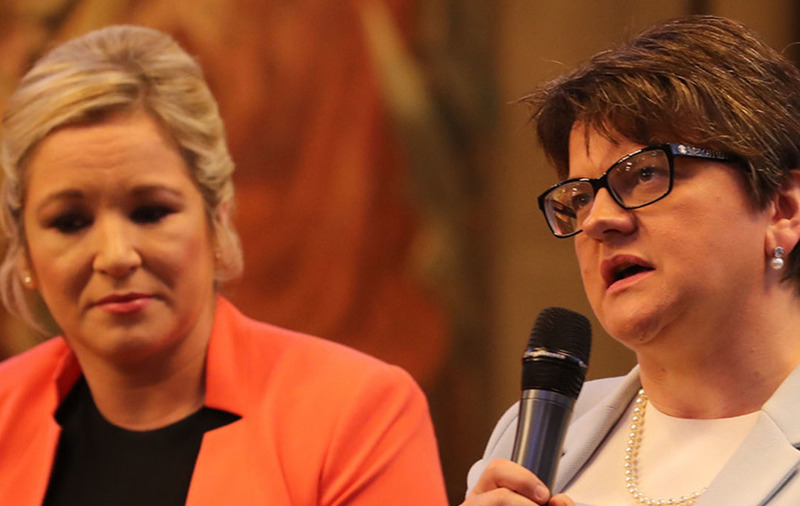 "That includes an Irish Language Act that provides the right to use the Irish language for official purposes in interacting with the State," she said. "The right to access coroners inquests; equal marriage; a bill of rights; and a commitment to tackle sectarianism."